Leaders today are faced with much disruption in their professional and industry sectors, with exponential change and the unpredictability and uncertainty that accompanies that. Much of what worked in the past for them, no longer does. In fact, they often have to do as much "unlearning" as they do learning. Maree believes that if leaders want to lead confidently in this environment, they need to make self-leadership their foundational and first priority. This is about them making a commitment to developing and enhancing their personality, behaviour, attitudes and mindsets so they can use their highly developed personal qualities to "lead from within", to shape their leadership. The Lead From Within Program is a very interactive program, depending on the full engagement of participants for its success. 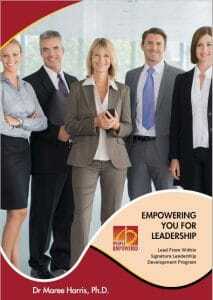 It focuses on seven self-leadership skills leaders need today. This is the program that takes leaders from what they need to DO, to who they need to BE, in this challenging new world. This 20 page, full colour, booklet is an outline of the program and the various ways you can engage with it. It also explains the way Maree will interact with you in planning, delivering and following up to make the program work for you and/or your organisation. Thank you, Maree, for running the workshop on “Leadership for Changing Times” for the Faculty. The insights the staff and I received from the workshop were invaluable as we have just been through a major restructure. The staff were able to see how they are all leaders regardless of the position they hold which is absolutely necessary for them to grow their career. I am sure that the tips and hints they took away from the day will be valuable for them all. Maree ran a fantastic two-day workshop at Mount Hotham that focused on relating our thought processes and personalities to the way that we lead within an organisation. While a lot of 'soft skills' sessions can seem nebulous and ill-defined, this was certainly not the case with Maree, who took the time to get to know individuals, explore scenarios specific to them, and relate these scenarios back to psychological concepts. This led to us developing great tools to lead and manage our teams. Better still is the offer to follow-up and assist after courses, and the effort that Maree put in to meeting with us - even to debrief outside of hours! Maree’s course on 7 soft skills for leadership brought to my attention exactly what is lacking in leaders today and knowing, if I can improve on those skills, I am opening up doors in my career path that weren’t previously thought of. The way she related the necessity to have strong soft skills in leadership roles to my business was a credit to her delivery methods. Her vast knowledge across the leadership requirements in today’s business landscape was a wonderful experience to tap into. I thank her for a truly helpful experience. I have attended a CPA seminar facilitated by Maree. It was called "5 soft skills for leadership". Additionally I have spent time with her discussing many other aspects of management and leadership. Maree is well researched and an obvious expert in her field. She has the ability to keep things simple! She is inspiring. She helps keeps things in perspective and she is a great resource. I would highly recommend that you attend one of her presentations because it is well worth seeing where it might take you.